Split the trifle sponges and make little sandwiches of them by spreading 1/4th of the jelly in each, then place them into the base of your glass bowl. Grind up the Amaretto cookies in a food processor. Sprinkle most of these evenly over the sponges and reserve some crumbs for sprinkling over the top at the end. Pour half of the Limoncello over these. Put the remaining jelly into a wide saucepan with the lemon juice and melt over a low heat. Add the blackberries and turn up the heat for a minute or so just until the juices start running. Pour berry mixture over the sponge sandwiches to cover and let sit while you complete the rest of the recipe. With a hand-held electric mixer, mix the egg yolks with the sugar until you have a thick smooth yellow paste. Add in the remaining Limoncello and continue mixing until you have a light mousse mixture. Mix in the Mascarpone cheese until everything is smoothly combined. Finally, in another bowl, whisk the egg whites until firm. Fold these into the lemony, egg-y Mascarpone mixture. Spread this gently over the blackberries in the glass bowl. Cover the assembled trifle with plastic cling wrap and leave in the fridge for the flavors and textures to steep and meld for at least 4 hours and up to 24 hours. Take the trifle out of the fridge for about 40 minutes to an hour before serving to get to a cool room temperature. Sprinkle remaining amaretto cookie crumbs on top. 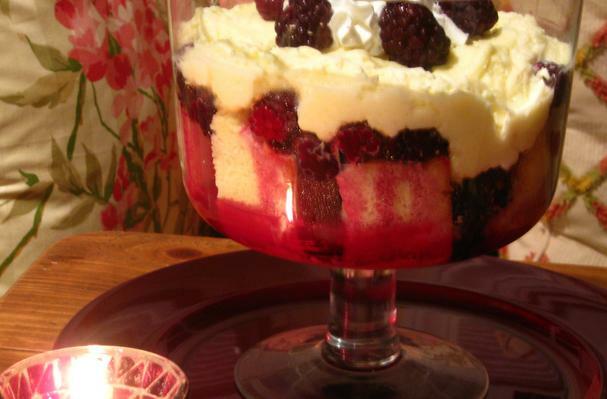 This trifle is seductively red with the juice of berries, sweetened with Italian Marscapone cheese, Amaretto cookies, and then spiked with Italian Limoncello. It is decadent, rich and a very special dessert, stunning in presentation, and all around yummy! This lemony, almondy, cream-swathed berry delight lends well to a perfect ending for a romantic dinner with your sweetheart or for a special occasion! http://bellavita-bellasblog.blogspot.com (posted on February 14, 2010).